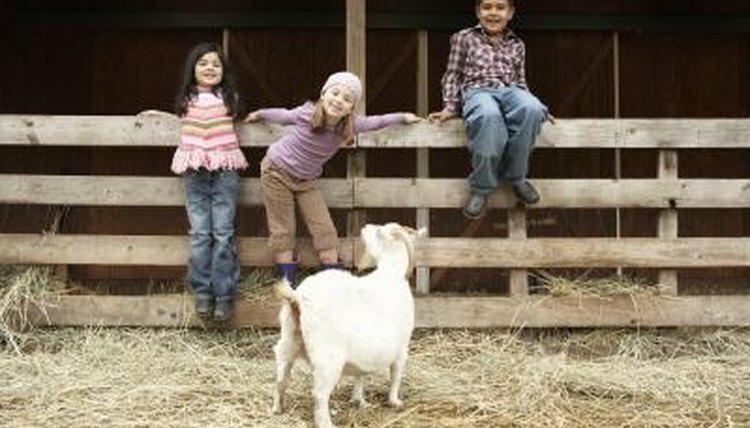 Watching your goats drop and trample their hay is like watching them eat money straight out of your wallet. Good quality hay is a crucial and costly part of your goat's daily nutrition, especially if you live in an area where your goat's access to naturally growing forage is limited. A hay feeder helps eliminate hay waste by keeping hay clean and off the ground as your goats eat it. Hay feeders are a simple and effective way to save feeding time and money while caring for your goats. Take your measuring tape and use it to divide your four wooden boards into 2-foot-long sections. Mark each section off with a pencil and then use your saw to cut the boards. You should wind up with 16 individual sections of board, each of them should be 2 feet long. Assemble eight of your 2-foot-long sections of board into a pair of squares. Nail the square together using your hammer and your 3 inch nails. Use two nails in the end of each board to fasten it to the next board. Nail a 2-foot-long section of board into the top part of each corner of each of your squares; when you finish attaching the legs to your squares they should look more or less like a pair of coffee tables. Place one square on top of the other so that the legs of one sit on top of the square top of the other. Nail the square into place using your 3 inch nails and hammer. You should now have a cube-shaped feeder with four legs that hold it off the ground. Run your wire fencing inside of the square top of your feeder. Line the bottom and sides of the feeder with wire and then nail the wire into place using your u-shaped fencing squares. Cut excess wire fencing away using your wire cutters.  If you want to build a hanging hay feeder instead of a standing feeder, leave the legs off the second (bottom) square and instead drill eye bolts into the top of the cube. You can hook chains to the eye bolts and hang the hay feeder from the roof of your enclosure.